WHEN DOES THE ROAD END? Is the road your on right now going somewhere? 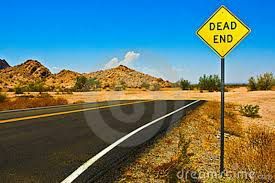 Or have you seen signs suggesting that it is a dead end?It pays great dividends to be able to read the signs along the way. Sometimes one road will not take us to where we want to go. When this happens it becomes frustrating and we can get caught up in feeling as though there is no way out. But the road does not belong us we are just mere travelers on it. Someone else built the road and has decided it is a dead end for those on it. The dead end road is only for those who wish to remain on it. For others it is a great signal that it is time to switch gears and get it moving in another direction. Do not allow someone else to decide for you which road you stay on!